Hamas officials met with EU representatives, sense that US is slowly 'coming around' on unity pact, deputy leader claims. Hamas deputy leader Moussa Abu Marzouk, who is deeply involved in ongoing negotiations between Hamas and Fatah, said in a newspaper interview that Hamas is not opposed to the appointment of Palestinian Authority (PA) "prime minister" Rami Hamdallah as the "prime minister" of the Palestinian Arab "unity" government. Abu Marzouk noted that the Palestinian Arab parliament will convene within a month and Hamas will participate in the next parliamentary elections and the presidency - despite not having an official candidate. Hamas is waiting on PA Chairman Mahmoud Abbas to make the announcement, he said, pending the PLO's decisions on reforms and the official establishment of a date for the Palestinian National Council elections. Abu Marzouk also revealed that Hamas recently held talks with the European Union (EU) and an unofficial American representative. Hamas officials "sensed a change in the American position," he said - hinting that the US is becoming more open to the idea of a Hamas-led "unity" Palestinian Arab government. A senior US administration official had said last month that the United States would have to reconsider its assistance to PA if Fatah and Hamas form a government together. Hamas officials, meanwhile, continue to debate over how the unity pact will affect the "struggle against the Occupation." Abu Marzouk stated that "there is a need to diversify" Hamas's approach to the "Palestinian problem," but Hamas leader Ismail Haniyeh disagrees. Haniyeh stressed over the weekend that an armed struggle is the only relevant answer to establishing a Palestinian Arab state. "Reconciliation comes only to strengthen and maintain the armed struggle to deter the ongoing occupation, and the crimes that harm our people," Haniyeh claimed, in a speech Saturday to a Gaza mosque. He reiterated Hamas's commitment to "restore the liberation of Jerusalem from the taint of occupation." 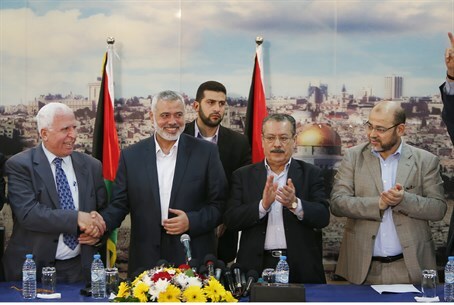 Hamas continues to be adamant over its full control of a "unity" government, expressing over and over again that it would remain in control of both Gaza and the PA after elections and insisting that Haniyeh would rule the government. More recently, Hamas announced that any "unity" government would be unequivocally subject to their approval before being established. The group’s charter calls for the destruction of Israel, and Abu Marzouk has ruled out the possibility that Hamas will recognize “the Zionist entity,” even after the unity pact with Fatah. Hamas representatives have already claimed that the PA's police forces will be integrated into Hamas's police in Gaza, less than a week after co-founder Mahmoud Al-Zahar angrily denied allowing Hamas to be integrated into the PA side of law enforcement. Concerns have been raised about the international community's response to a Hamas-control government, as the EU has expressed support for the pact - fully convinced that Abbas, not Haniyeh, will take the lead.